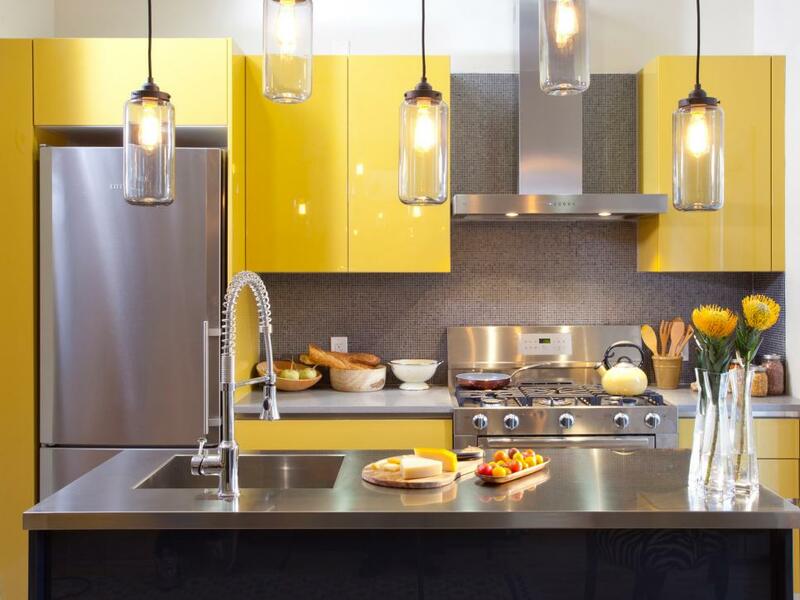 If you’re tired of ordinary (read: neutral) kitchen cabinets, take yours to the next level by bringing in bold, swoon-worthy colors. From subtle pastel hues to high-gloss finishes, eye-catching options are endless, and will leave you wanting more within your own space. Open floor plan kitchens are majorly covetable, but it can be tough to really define the space and make it stand out on its own. Seperate the cooking space from the rest of the living area by throwing on a few coats of paint. While neutral shades may be the obvious route, this classic kitchen proves that taking a chance on something more colorful can really pay off, especially when done in a softer shade that won’t overwhelm the space. One way to make a big impact in your kitchen is by embracing the two-tone cabinet trend. Highlight the lower cabinets with a fun hue, while keeping the upper cabinets and walls a bright, crisp white. Create a stylish contrast by opting for a bold base that will make any space feel magazine-worthy. This approach is ideal for smaller spaces since a total color overhaul runs the risk of making your limited space feel even tighter. Introduce pops of color throughout the rest of the room to tie this dramatic look together. A pop of color will go a long way on its own, but makes an evem stronger impact when paired with a high-gloss finish. Most shades will work, but choosing something warm and sunny — like this classic yellow — is ideal for a first timer. Keep any exposed walls, backsplashes, appliances and countertops neutral so those glossy cabinets can take center stage. From gunmetal gray to navy blue and every dark shade in between, these moody hues are the way to go if you want your kitchen to give off a sophisticated vibe. The unexpected choice serves as the perfect complement to countless decor styles and finishes to make your kitchen one of the most stylish rooms in the house. Brass hardware, wood countertops and antiqued rugs all look sensational when paired with extra dark cabinets. For those looking for the ultimate showstopper, look no further than this tone-on-tone kitchen. This complete color takeover is definitely a commitment, but will no doubt become one of the highlights of your home. By matching the cabinets, walls, backsplash and island, this monochromatic space instantly brings the drama. Introduce a few other complementary colors through your cookware, serveware and general decor, but let your chosen shade do most of the talking. Dark, glossy and green, these simple cabinets add a sophisticated edge that can’t be ignored. The swoon-worthy color choice helps the kitchen’s dark marble countertops, intricate backsplash and luxurious floor feel unexpected and elevated, while brass hardware and accents add contrast that make the dark green backdrop really stand out. While blue may be a popular color choice in just about any room, there’s something about this cool shade that adds a whimsical feel to this modern kitchen. Not only are the cabinets dressed up in this lovely hue, it continues onto the island and the cabinet-front fridge. Talk about a statement room! This room proves the importance of thinking outside of the box and not limiting yourself to standard paint chip samples when renovating your kitchen. Cabinets can look fantastic in an array of different colors, even unexpected, or hard-to-describe shades. While a traditional blue may seem like a safe bet, opt for something a bit more unique like this blue-gray shade with hints of green. It makes a strong statement while helping the hardware, lighting, seating and appliances stand out in a very chic way. 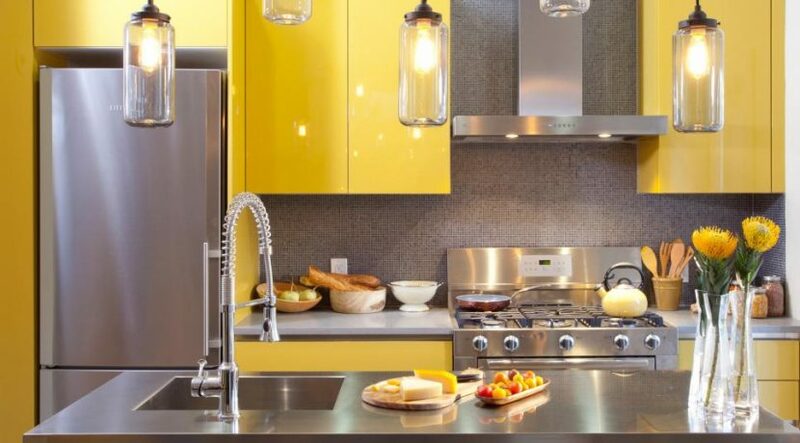 Having vibrant cabinets span your whole kitchen isn’t a necessity. Showcasing two or three standalone cabinets in a unique color will create a colorful accent that completely transforms the space as a whole. This is a great choice for people drawn to truly bold colors, like this electric orange, as it’s the perfect pop of brightness that doesn’t feel overdone.